This is from Adventure Comics No. 319, in which the Legion has a very dangerous mission against what turns out to be a couple of very old men. Before they can get the ageism train a-chuggin' off to Beat-the-Elderly Town, they have to be divided into teams for some reason - possibly because of drama. This being the Thirtieth Century, those crazy kids don't just go 'eeny-meeny, etc' to choose folk, nor do they (god forbid) make logical team choices based on the skills, powers and personalities of various Legionnaires. 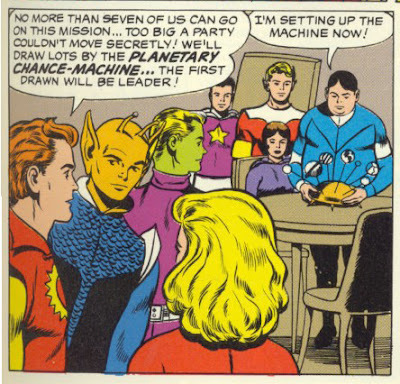 No, they turn to the Planetary Chance Machine, because if the Legion has an unofficial motto, it's "Over-complicating everything through technology." I'd just like to note that the Legion is attacking a planet. An eighth person on your team isn't going to make you much more noticeable, Sun Boy. 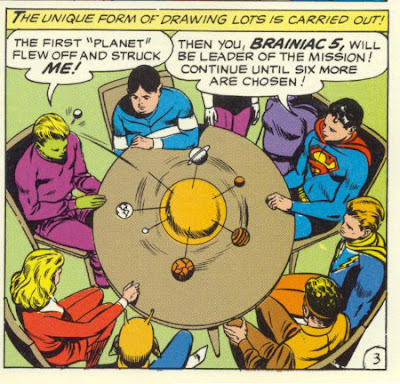 And that's the Planetary Chance Machine: better than, say, pulling names out of a hat because there's no way that the hat is going to pick a team consisting of Brainiac 5, Sun Boy, Proty II, Bouncing Boy's chair, two walls of the Legion Clubhouse and Brainiac 5 again. The really sad part is that this was the simplest thing that they could come up with. I happen to know that by the Thirtieth Century Paper, Rock, Scissors has become a months-long strategy game involving thousands of tiny robots that are made out of the game's three elements, while the 'straws' involved in drawing straws are carbon nanotubes, each a light-second long, that must be drawn with a small space-tug and subjected to microscopic analysis to determine which is the shortest. Hot Potato is still pretty fast but humans aren't allowed to play it any more due to a poorly-worded treaty with the Dominion. Did anyone else think that Fire Lad looked creepy in this one? Poor Subbies. The don't get no breaks. 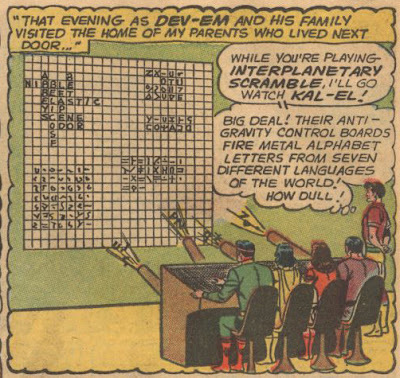 Not actually from the future, but still high-tech and from Dev-Em's appearance in Adventure Comics No. 320. Presenting Krypton's favourite game, Interplanetary Scramble! I seriously wish that Earth had cannon-based party games - maybe then alien races would give us props like they do the Kryptonians, who didn't even know the difference between Interplanetary and Intraplanetary, for Rao's sake (and, uh, who didn't listen to their top scientist when he said the planet was going to blow up and then got blown up)! I bet it would bring families together like no-one's business, plus every once in a while someone's brother would get mad at them and they'd have to come to school with a bunch of Cyrillic characters printed across their forehead. Intraplanetary Scramble is completely JOHN APPROVED.